1st prize: $1000 cash prize for best costume! 2nd prize: 2 night stay in Sheri’s hotel, 2 dinners per night, 2 drinks per night! 3rd prize: Champagne dinner in our private formal dining room! Ah, Halloween! The night when everyday women dress up like prostitutes, and prostitutes dress up like…sluttier versions of everyday women. Halloween is by far the sexiest Holiday of the year, and Sheri’s Ranch is the hottest place to celebrate it! Costume party connoisseurs are ever in search of the wildest, most bizarre Halloween event. A celebration so peculiar that the occasion is forever seared into a party-goer’s memory. The Halloween party at Sheri’s Ranch, the Las Vegas area’s premier legal house of prostitution, is such an affair. Have you ever gone to a costume party at a brothel? Imagine an incomparable gathering, where dozens of hellacious harlots join forces with mutants, monsters, and multitudinous malformed miscreants for an evening of orgiastic overindulgence! 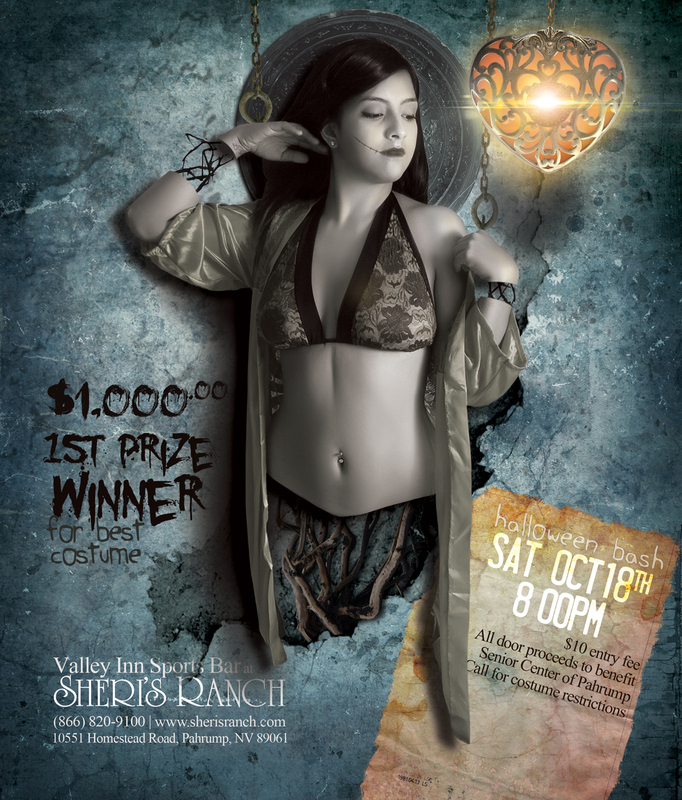 The annual costume party at Sheri’s Ranch is the Las Vegas area’s naughtiest Halloween event, and YOU are invited. There will be drink specials all night long and FREE food. There is a $1000 prize for best costume, so wear your wildest, most unique ensemble. For more information about this amazing annual event, call us at (866) 820-9100. I’m so excited for the Halloween party! It’s going to be amazing, I can’t wait to see everyone’s costumes! They are so much fun Violet! I know this will be your first one 🙂 get ready to PARTAY everyone! I’ve been to many and they are all a blast! Incase you haven’t been the Parlor turns into a dance floor and something about the celebration always has us Ladies fired up in spirit and celebrating the night away. I think it’s great to see our staff enjoy themselves too helping out. Last year the housekeeper was gettin down on the dance floor doing ultimate multitasking cleaning the floor! Get it!! Don’t miss out! This year I will be the SuperBowl Champion, Go HAWKS!! I’m working on making my own Lombardi replica now! Can’t wait to see the turn out and who wins the prizes! I’m going to miss the party this year. But if I have the means, I’ll be sure to make sure I don’t miss the party in ’15. I love dressing up for parties!!!!! Can’t wait to show off my costume. This will be my first party at Sheri’s as well, can’t wait!